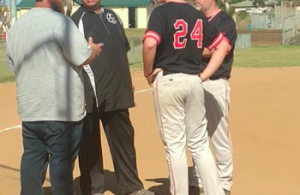 PALA INDIAN RESERVATION (4-7-2019) – Because of changes in the CIF power index formula, which affects which schools advance to the playoffs, Grossmont High coach Jerry Lerud was concerned if this weekend would be the Foothillers’ final journey to Valley Center’s annual Jaguar Classic. Worse yet, any of Saturday’s (Apr. 5) tournament opponents are all ranked lower than the Hillers, so the school was in a no-win situation even if they captured the crown. And that goal fell one short. Following a solid 6-4 triumph over the tournament hosts in the semifinals, Grossmont fell in the title game to Ramona, 7-6. The event was held at the Jim Banks Sports Complex at Pala. RAMONA 7, GROSSMONT 6: The Foothillers rallied from a 6-1 deficit, including three runs in the bottom of the 7th, but just fell in a dramatic conclusion to the tournament. 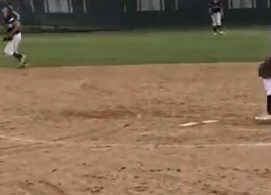 The Hillers had the potential game-tying runner on third base, so Ramona called for relief pitcher Mackenzie Rutkoff to register the final out and prevent a miracle finish for Grossmont. Despite walking two batters to load the bases, Rutkoff finally earned the save with a game-ending strikeout. 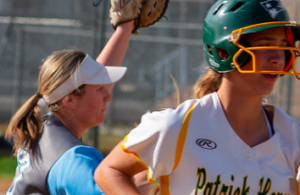 Grossmont’s rally started with four consecutive singles — by Kati Contreras, Sam Roope, Jordan Brown and Halle Sweiss (RBI) — to trim the deficit to 7-4. Rainee “Raindog” Foster followed with a sacrifice fly to left field for an RBI to make iy 7-5. However, the Bulldogs outfield threw the ball to another base for a two-out play. The out on the bases proved important after Jessica Medlin drilled a double, but only one run would score instead of tying the contest. Rutkoff then came in to barely wrap it up. For Grossmont (11-7), five players — Natalie Emery, Contreras, Brown, Medlin and left fielder Alyssa Box-Agustin — all had two hits each. Ramona (9-7), after advancing to the title game by blanking University City, 2-0, saw first baseman Missy Miller (3-for-4) and shortstop Seneca Curo (2-for-4) drive in two runs each. Dawgs catcher Ashlie Alshouse also added three hits. GROSSMONT 6, VALLEY CENTER 4: In the semifinals, the Foothillers mounted a 5-0, then staved a rally by the tournament-host Jaguars. Samaria Roope regained a share of the East County home run lead with her sixth of the season. Her leadoff shot to center field made it 5-0 in the 3rd. Valley Center rebounded with three runs in ther 5th to makes things interesting, but Hillers relief pitcher Natalie Emery enter in the 6th, firing a perfect 1-2-3 frame to save the victory for Contreras, who allowed just one earned run in five innings in her longest stint of the season. For Valley Center (5-6), Taylor Friend hit a solo homer in the 5th to start the Jags comeback. GRANITE HILLS 10, CATHEDRAL CATHOLIC 0 – At Anaheim, similar to when East County teams would travel to Las Vegas for a tournament, only to meet each other, the Granite Hills Eagles may have been disappointed traveling about 100 miles to meet another CIF San Diego Section squad the Cathedral Catholic Lady Dons. However, the Eagles were not unhappy with the results by skunking Cathedral Catholic via run rule, 10-0 on Saturday (Apr. 6) at the Michele Carew Classic, held at Peralta Canyon Park. Eagles second baseman Brooke Bertussi paced the offense with a pair of 2-run homers for four RBI, as Granite Hills expanded an early 2-0 lead with six runs in the 4th. Bertussi’s first two homers of the season both went to left field. Starting pitcher Staci Chambers allowed just a pair of base hits over her four shutout innings, then Chloe Knepp recorded her first appearance in the circle this season, setting the Lady Dons down in order in a 1-2-3 fifth. With the win in this Silver Division quarterfinal-round game, Granite Hills moved to 13-7 overall. Cathedral Catholic fell to 4-11 overall, including a pair of setbacks to the Eagles. In Friday’s (Apr. 5) Silver Division contests, the Eagles fell to Santiago, 5-2, and to Saugus, 5-4. MONTE VISTA 9, MORSE 2: At Spring Valley, in order to set-up a run to the CIF Division IV softball championship, a high seeding is usually necessary. Thus, the Monte Vista Monarchs needed to a sweep in Saturday’s (Apr.6) final round of their tournament but fell one inning short. After defeating Morse, 9-2, in the semifinals, Monte Vista rallied to catch Holtville with a run in the 6th inning, but the Vikings answered with two runs in the 7th inning to claim the tournament title with a late 5-3 decision. Moments after the visiting Tigers tallied twice in the 5th inning to move to within 3-2, Monarchs left fielder Meeah Matanane immediately responded with a 2-run homer to help capture this semifinal-round contest. Matanane’s inside-the-park homer (on a fully-fenced field) to right field started a 6-run outburst. The blow also scored Ionna Upham, who led pff with a sharp single to cap a 3-for-4 outing at the plate to push her batting average over the .400 barrier. Meanwhile, Abigail Johnston tossed a 4-hitter, with both runs coming unearned, She also hit a double to go 2-for-3 at the plate, scoring twice. HOLTVILLE 5, MONTE VISTA 3: In a game of role-reversal from the semifinals, it was the Monarchs that rallied to get back into the championship contest, but the Vikings answered with two runs in the 7th to claim the title game. In the 6th, Dessire Corona (2-for-4) stroked a lead double, moving to third base when Alexis Cervantes placed a sacrifice bunt. The next two batters walked to load the bases, then a wild pitch would plate Corona. However, the Vikings rebounded with runs on a pair of errors and a passed ball. Monte Vista pitcher Abigail Johnston was the hard-luck loser, spinning a 2-hitter, but seven Monarchs errors resulted in four unearned runs. Holtville moves to 8-9 overall to enhances its postseason hopes. Monte Vista falls to 9-7, which still keeps them in position for a first-round playoff contest, although there is still a full mointh left in the regular season.